PEARL CHATS: If you are in a big hurry and don’t have the time for baking in the oven, this bread is microwaved! (As you can imagine, Serene despises the microwave part so we do include a baking option.) This was my first attempt at a white FP bread and it went viral. 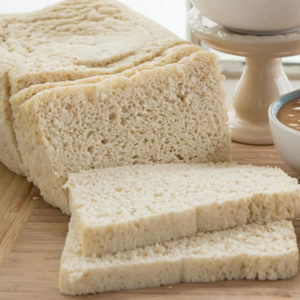 I have to admit that our WWBB (Wonderful White Blender Bread) has surpassed this as my favorite bread now, but Nuke Queen’s can still serve a great purpose for some people who can’t tolerate cottage cheese or whey protein.